31 bloggers participated in Nonfiction Monday this week. And the list is grows longer every week. What did they say? Click here. How do you choose a subject to write about? There's just so many things we are interested in. How do we pick just one? I work in a public library. Many times I have students come up to me at the Information desk and ask me to help them choose a topic for a paper. I have to tell them that nobody can choose a topic for them -- they have to choose it. Then I start quizzing them. What’s the subject they are studying? What part of it interests them? You can almost see that cartoon light bulb flash over their head as they come up with an idea -- and off they go to research it. You write best if YOU are intensely interested in the subject. Go find more about it -- and write. I went outside tonight about 10:30 Eastern time, to let the dog out, and something in the sky caught my eye. There was this round orange thing blinking through the waving bare limbs of the winter trees. With two very bright lights on either side of it. I wondered if it could be that satellite that the Navy was supposed to shoot down and I was seeing the expanding explosion? So, I came back inside (letting the dog come too) and cranked up my computer and looked on the CNN website -- my trusty source of news which shows things as they happen. Nope, the Navy still hasn't fired a shot. The orange thing was an total lunar eclipse. Amazing. I haven't seen one of those for years. It's more amazing than you know -- because a few hours ago we were in the middle of a snowstorm. And yet, right now the sky is clear and there's the eclipse. If only I had a telescope. One of those sparks of light beside the moon is supposed to be the planet Saturn -- sitting there the closest it has been or will be for a while. I wonder if my binocs will be strong enough to see Saturn's rings. Did you get a good look tonight? I had all these plans about grabbing some great nonfiction books from my library and talking about them -- only to remember that libraries are closed today. Soooo, I have lots of time to create a post and no books at home to talk about. I want to tell you about this wonderful nonfiction blog. It's called I.N.K. which stands for Interesting Nonfiction for Kids. I was amazed to learn that some of my favorite wonderful nonfiction writers are each posting messages here. Plus there are links to their websites where you can find more about them and their books. Wow -- to have all these people in one place. It's a feast! "Here we will meet the writers whose words are presenting nonfiction in a whole new way. Discover books that show how nonfiction writers are some of the best storytellers around. Learn how these writers practice their craft: research techniques, fact gathering and detective work. Check out how they find unusual tidbits, make the facts interesting and write something kids will love to read. Explore how photos and illustrations are integrated with the text to explain an artists vision of the world. Consider what subjects are flooding the market and what still needs a voice. 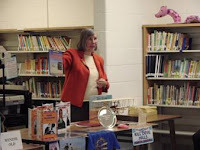 Rethink nonfiction for kids." and enjoy what they have to say. And then check out the other blogs who are featuring nonfiction on Mondays here. Scroll down to get the list, complete with links to connect you to these places. 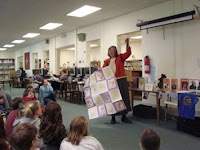 Here are a few pictures of me in full throttle, doing a school visit as an author at Arnold Elementary School in Arnold Maryland in 2007. With any luck, this link should take you to a web page that shows more of this visit. Jackie Parker, whose Blog is right here, put this message at the end of her e-mail -- and it's so good that I had to quote it. This room's the greatest arsenal we could have - arm yourselves!" --The Doctor (#10) in Dr. Who "Tooth and Claw"
Punxsutawney Phil has spoken -- He saw his shadow and there will be Six more weeks of Winter. You can check it out on the Official webside of the Punxsutawney Groundhog Club. On the other hand, if you live in the South the Georgia groundhog, General Beauregard Lee, did not see his shadow -- so you-all down there will have an early Spring. Labels: Groundhog Day, predictions, Will Spring be early or late?